A concert band is such a remarkable entity. 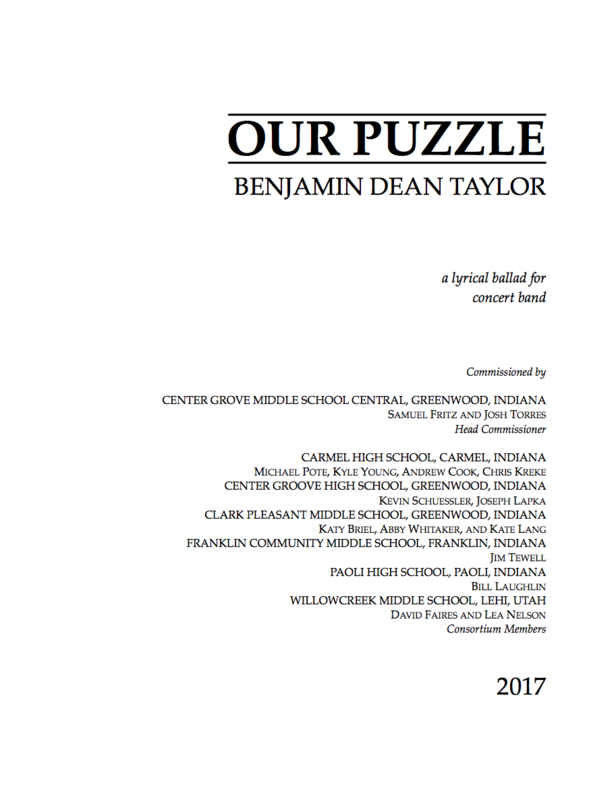 A group of individuals from a variety of backgrounds and life experiences come together to play music and become "a band,” like a puzzle coming together. All members of that puzzle are equal partners. They know each other, understand each other, and are unified in the process of creation together. Each individual grows, learns, progresses, as they practice and perform together. Thus, the band as a single unit evolves and grows accordingly. Time progresses and a member of the band leaves, graduates, moves on, and so someone new comes to take their place. A period of adjustment follows. Everyone misses the former member of the band and will never forget them or the music they shared together. Yet the new member of the band is different - not any better or worse, just different. The "new" puzzle isn't any better or worse than the "old" puzzle, but certainly changed somehow. Some players miss the old band sound and the old band members. But now everyone discovers they can love the new band entity without taking away from their love of the old. My good friend and poet, Christine Brandel, captured these thoughts in colorful imagery in a poem she wrote for me. I reprint the following with her permission. We’d spent all day inside, each carving our own exquisite wood. Mine was cottonwood, so I had been careful. His was harder walnut, hers a deep mahogany, altogether we had every shade and tone a person could dream of. We went outside and set them in the sunshine. With a little turning and fine tuning, they all fit together like a puzzle. A pastiche. A polyphony that played in ways that were perfection. A couple passed us and dropped some money onto the ground, proving we were not the only ones who saw how well we worked. Then, someone else asked to buy our art, but we refused. Each piece had to be there to be complete, and what was complete could only be ours. At the end of the afternoon, we picked up our carvings and took them home. We returned each day to display and admire what we’d made, together. Until one morning when the rosewood wasn’t there. His was only one small piece, but its lack was too big. We stared at its absence. A man on the other side of the road watched us watching our art as if waiting for it to be whole again. He came over and made us an offer, pulling a beautiful butternut carving from his pocket. One of us took it into his palm and placed it where the rosewood had been. It didn’t fit. The man bent down, swapped a few pieces round, rearranging ours until he revealed room for his. The art was whole again. We all looked at each other, then at the man, and at the art. The next day, he arrived as we were putting down our pieces. This time he pressed his piece next to mine. I hesitated. The others then moved theirs, and when everyone had finished, we had a new puzzle. Something different but complete had come together. This work is available exclusively to consortium members until August 2018. Please email benjamintaylormusic@gmail.com with any questions.